This Masterclass was recorded by the BBC at Bream’s house for their Masterclass Series in 1978. Unfortunately all I have is a video recording direct from the TV. Hence the low quality image! I think my biggest learning curve from this lesson was actually when I was able to watch the recording on television. I had never heard myself play before, and one thing I have noticed consistently through the years is how different a piece sounds to your ears as you play it, to how it is received by the listener. What I mean by this is that the intention you have as you play a phrase (and what you hear as you play) is often not how it actually comes across. The depth of feeling I had for Sevilla did not come across – it was definitely too agressive – yet it didn’t sound that way to me at the time. It was much easier to take in Julian’s comments when I could sit back and listen to myself objectively. So my advice would be to always record yourself and listen to how you actually sound, and not how you think you sound! Then you can adjust your performance to have the effect you intend! Welcome to the official new website of Cheryl Grice! 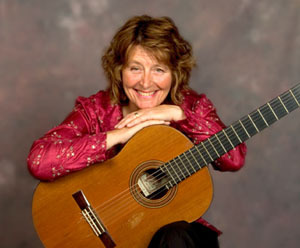 After many years of juggling performing and raising a large family of very strong individuals, 2011 saw my return to a full time music career touring with the New Zealand Guitar Quartet. Whilst I thoroughly enjoyed performing with these very talented guitarists, the experience also served to crystalise for me where my heart and my gift truly lay as a musician, which is in being able to express myself spontaneously in the moment, with what I am feeling in my heart and my soul. So I am being true to myself and returning to what I love doing most – my solo music! This year, whilst organising future tours and recitals for 2013/14 I have forayed into the world of composing for the first time, which I am finding to be an exquisite combination of extreme joy and frustration! Again this becomes an expression of who you are and what you feel, and the joy (and pain) in creating new music has taken me very much by surprise. I look forward to playing some of these pieces for you in future recitals. I hope you enjoy my weekly blogs, and that you find them both interesting and informative. We all strive to achieve perfection in our playing, and whilst this is of course an important aspiration, remember to always take pleasure in the journey! The essence of Music is in expression – not in technical pyrotechnics. Make sure that you use musical expression and phrasing whenever you play (wrong notes and all)! and don’t ‘just play the notes’ – say something! Enjoy the journey – don’t wait until the notes are ‘perfect’ before allowing the music to sing.